AFC, APCO’s frequency coordination department, is pleased to introduce its network of dedicated local advisor volunteers. APCO’s advisors are responsible for frequency coordination in their home state and we would like to bring awareness and recognition to the dedication they exhibit on a daily basis. Please feel free to reach out to our local advisors with any questions dealing with FCC Part 90 licensing and frequency coordination. John Ruggiero has been employed by the Massachusetts State Police for 14 years, starting as a Dispatcher and later a Shift Supervisor at the New Braintree Regional Communications Center, followed by positions as a Radio Technician and now a Communications Engineer. John’s responsibilities include assisting with the design, specification, installation, programming, monitoring, maintenance, troubleshooting, diagnosis and repair of various communications systems. He is one of the system managers for the Massachusetts Statewide Trunked Radio System. He provides technical assistance to the MSP radio shops and assists with major projects, such as the 800 MHz Rebanding Project. 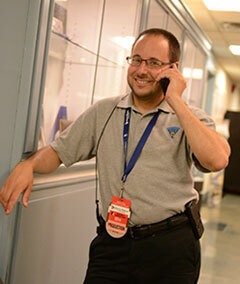 He also acts as a technical liaison, educator and support person for users of the state’s communications systems. John holds a Bachelor’s Degree of Science in Electrical Engineering from Worcester Polytechnic Institute. He has been a licensed amateur radio operator since 1994, and currently serves as a Volunteer Examiner and Section Emergency Coordinator in Western MA. He has been the APCO AFC Local Advisor for MA and RI since 2012. He is also a member of the FCC New England Region 19 700/800 MHz Planning Committees and Technical Subcommittees. He is a Massachusetts certified Communications Unit Leader (COML).